"Words have life and must be cared for. If they are stolen for ugly uses or careless slang or false promotion work, they need to be brought back to their original meaning - back to their roots." "Groceries became a revelation: the people coming out with bundles of food. It's all like a great ceremony, and the whole drudgery of shopping has become my inspiration." "Maybe we are less than our dreams, but that less would make us more than some Gods would dream of." "A painting is a symbol for the universe. Inside it, each piece relates to the other. Each piece is only answerable to the rest of that little world. So, probably in the total universe, there is that kind of total harmony, but we get only little tastes of it." "Someone remarked that the newspapers or the news magazines are the same as the psalms except that the names changed in the stories. Maybe you can't understand the psalms without understanding the newspaper and the other way around." Born in Iowa in 1918 to a large, loving, and pious Catholic family, Frances Elizabeth Kent was the fifth of six children. Her father was a businessman in Iowa, but at a young age they moved to Vancouver, Canada for him to try his hand in his brother's hotel business. Then, in 1923, the family moved again to Hollywood, California. Not the world-famous, star-packed area it is today, in the 1920s Hollywood was an up and coming, but fairly quiet area. Throughout Kent's lifetime she saw the city change drastically, but in her childhood, she remembered it as a fairly unassuming part of Los Angeles. Throughout her childhood, Kent was always drawn to creative design and sketching. She recalled "always making things, like designing things, paper dolls and their clothes, and then drawing." Kent said, "My parents - my father especially had always been very encouraging. But both my parents were always encouraging. I took it very lightly; I didn't think of it as being anything too much. But I was always interested. I did the posters in school and all that." Whilst she did not think too much of her early talents, her parents and teachers did. Her father, perhaps, saw a talent he wished he had explored himself; Kent told an interviewer, "Well, I think he was probably meant to be a poet. He could play the piano; he was just a really fun guy. And he was burdened, I think, by six kids. And my mother, too, I think was really probably meant to be more a person of my kind of life, who had a chance to develop her own thing. So they were both, I think, people who were saddled with six kids at a time when Catholics had lots of kids..."
Kent attended a Catholic primary school, and then the Catholic Girls High School, run by nuns of the Immaculate Heart, in Hollywood. Kent remembered ruefully that the older nuns' approach to art classes was to have students copy old masters, but some of the younger nuns were passionate and engaging teachers. They saw great potential in Frances and encouraged her to continue her training in art after she graduated from high school in 1936. To the shock of some of her young school friends, 18-year-old Frances declared her intention to join the Immaculate Heart Convent and continued studying at the private college the sisters ran. That year, she became a novice nun and student at Immaculate Heart College. From 1936 to 1941, Kent studied and lived in the Immaculate Heart community, taking the name Sister Mary Corita. Throughout these five years, Kent not only studied art but also trained as an art teacher and then taught students after her first year. While she enjoyed the teaching to some extent, she mostly relished the opportunity to expand her own art. While one might imagine Immaculate Heart College to have a reputation for traditionalism and conservatism, given the religious nature of the school, it was in fact dedicated to the liberal arts and known as a hotbed of avant-garde ideas. Several members of faculty made a large impression on her, including art historian Alois Shardt, who had escaped Nazi Germany and wrote about avant-garde German art. In 1941, Corita graduated with her BA degree. 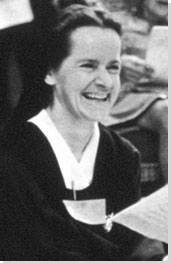 She remained in the convent community but was called away in 1944 for a teaching post in British Columbia, Canada. When she returned in 1947 to teach at Immaculate Heart, she also began a Master's degree in art history at the University of Southern California, which she completed in 1951. Toward the end of her time at USC, she took a printmaking class, where she learned more about silk-screen, or seriagraph, printing. 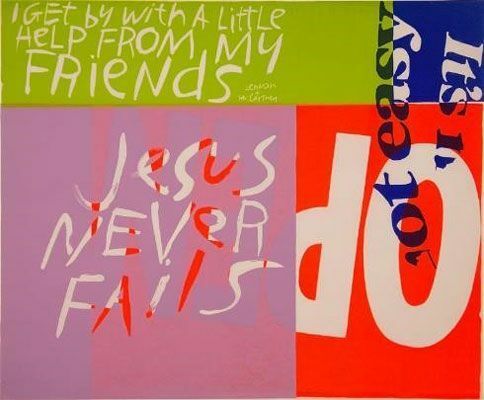 In 1952, only a year after completing her studies, Corita Kent had a breakthrough: she won first prize in both the Los Angeles County print competition and the California State Fair for The Lord Is With Thee. Kent recalled in an interview that much of her subsequent, formative education in screen-printing came from Maria Sodi de Ramos Martínez, a printmaker married to the Mexican muralist Alfredo Ramos Martinez. Also in 1952, Kent returned to Immaculate Heart and took up a full-time teaching post at the college art department; as only one of two permanent members of staff. Her reputation, as both a teacher and an artist, was growing. 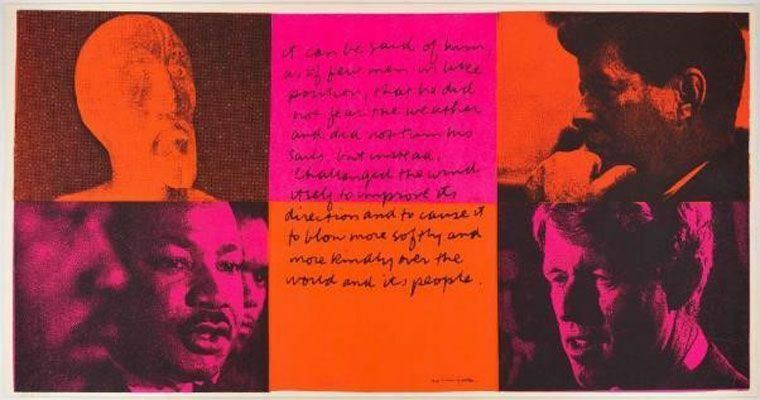 By 1954, Corita began using text in her prints. Following from the graphic posters she had made in her schooldays, Corita began consciously using a more graphic style in her work, mixing images with typeface. Art historian Donna Steele explained, "Her work evolves from abstract, figurative, religious pieces to a point where it becomes entirely typographic text. The word becomes the picture." 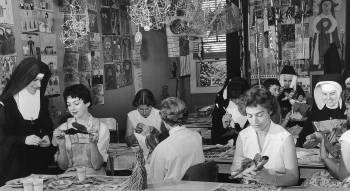 During the mid-1950s and throughout her experimentation, Kent's classroom became a magnet for avant-garde artists, including the composer John Cage, the architectural luminary Buckminster Fuller, and, consequentially, the designer Charles Eames, who Kent credited with being one of her greatest teachers. She recalled, "From Eames or any of his works we learn to form outworn distinctions and separations and to see new relationships - to see that there is no line where art stops and life begins. He talked a lot about connections." 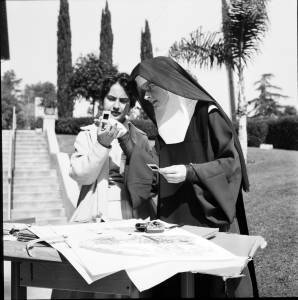 She also went on an informative trip in the late 1950s, with her fellow art department colleague Sister Mary Magdalene, travelling throughout Europe and Egypt and collecting folk art for Immaculate Heart College's collection. Having experienced more of the world and different artistic traditions, she returned after several months to see her own art refreshed. A fateful day in 1962, though, changed her trajectory; she went to see Andy Warhol's breakthrough exhibition of Soup Can paintings at the Ferus Gallery. She said, "Coming home you saw everything like Andy Warhol." 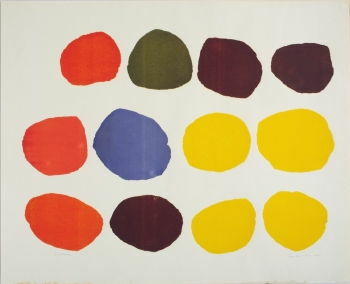 Wonderbread (1962) was Kent's first Pop art print, inspired by seeing Andy Warhol's exhibition in the same year. Corita saw a kindred spirit in Warhol. 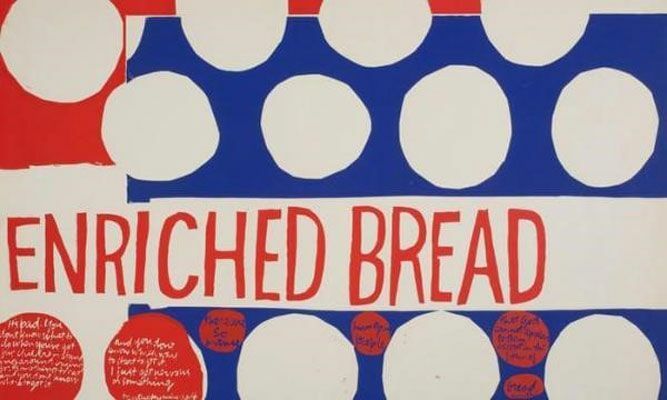 She immediately began working on her first true Pop print, Wonderbread, in 1962. Wonderbread consists of twelve, slightly irregular oval shapes in bright primary colors, set against a white background. Gone are the layers of paint, the Abstract Expressionist drips and brush strokes. Wonderbread is a pure Pop print; clean lines, bold colors, simplified shapes. Only the title gives an indication of what these oval shapes could be; Kent hints at the shape of the most wondrous bread, the communion wafer used to represent the body of Christ in the Catholic Communion service. 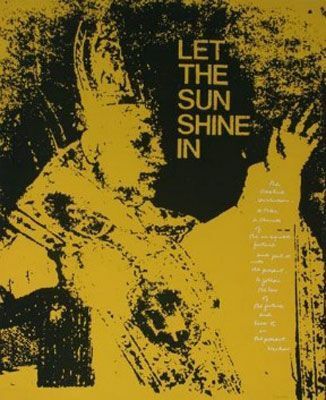 Subsequently, her work became bigger, bolder, and more colorful; she began to use a much wider and more eclectic range of reference material in her prints, from advertising logos, packaging aesthetics, Beatles lyrics, quotes from Albert Camus and Samuel Beckett, and Bible verses. 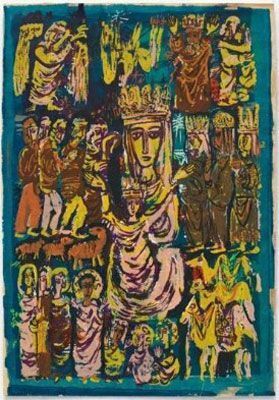 She began to print prolifically and cheaply; her work balanced the commercial and spiritual worlds to produce a message of hope and joy. She enjoyed printing, as it was accessible for a wide range of people and explained, "art enhances people's lives and that people needed to be able to see it, own it and possess it." She began to mix with influential LA figures, including filmmakers, writers, teachers, academics and artists. She regularly visited the Eames household for dinner parties and welcomed the visionary architect and designer of the geodesic dome Buckminster Fuller into her studio. 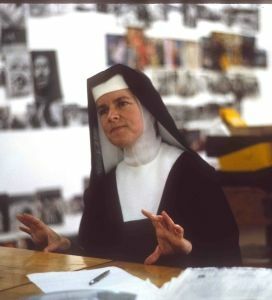 Corita Kent, now a nun in her mid-40s, became an absolutely vital and ground-breaking artist and art educator in L.A. Meanwhile, Kent had become the head of the Art Department of Immaculate Heart in 1964. Her classrooms became unique and dynamic environments. Artist Julie Ault explains, "Multiple films were screened simultaneously, rock music played on the stereo, and large-scale collaborative projects were usually in process. Buckminster Fuller, described visiting her classroom as 'one of the most fundamentally inspiring experiences of my life.'" Her students were taken to supermarkets and intersections for observation sketching and often practiced blindfolded painting. Her countercultural influence was felt not only in the art department but the entire college. Kent took over planning for the annual Mary's Day celebration for the college. For years, the ceremony had been the same; the women wore white gowns and walked in a procession to mass, but under her guidance in the mid-1960s, the festival became more like a hippie happening, with bright summer dresses, flowers, tambourines, and guitars. In the first year of the new celebrations, the theme was World Hunger, and Sister Mary Corita's students carried 3D placards of blown up food packaging. As well as these innovations, Kent continued with an exhaustive schedule of lecture tours, exhibitions, teaching, and printing. 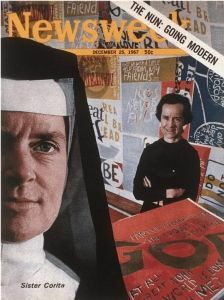 In 1967, Newsweek featured her as "The Nun: Going Modern." Within the Catholic Church, however, complaints against her controversial art and teaching built up against her. For Kent, art was an important tool in modernizing and "shaking up" the Church and presenting Christian messages in new ways. However, the archdiocese saw her work as frivolous and potentially blasphemous, and the archbishop wrote to the Mother General of the convent complaining that he had "received many adverse comments and criticisms of this type of artistic representation...." His furious letters continued, "What pertains to the liturgy and to sacred art comes within my jurisdictions. 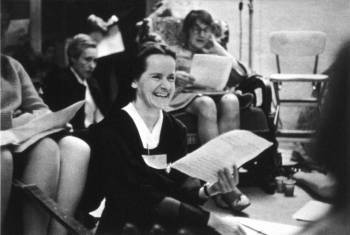 We hereby request again that the activities of Sister Corita be confined to her classroom." By 1968, exhausted by the busy schedule and constant pressure from the Church, Sister Mary Corita took a sabbatical on Cape Cod and then decided to seek dispensation from her vows and left the Immaculate Heart Order for good. Only a year later, the entire order left the official control of the Catholic Church following continued criticism of the remaining sisters' teaching methods. Aged 50, Corita found herself living alone for the first time in her life. She could not drive or cook. She moved to Boston and found herself an apartment of her own. With this dramatic life change, her work became more radical. Loosened from the censors of the Church, Kent began to more forcibly express her political views in the turbulent late 1960s. She said, "I admire people who march. I admire people who go to jail. I don't have the guts to do that. So I do what I can." 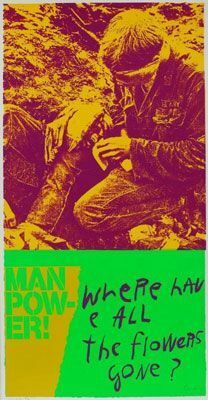 What she could do was to draw attention to issues of hunger, race, civil rights, poverty, and the violence of American military aggression in Vietnam through her prints. She was strongly influenced by the radical priest Daniel Berrigan, who was a Christian Pacifist who publically campaigned against the war in Vietnam. After a flurry of political works from 1969 to the early 1970s, Kent's work mellowed considerably. Like many activists of this time, she was tired of the fight and said that "the time for physically tearing things down is over." Also, her life became more physically difficult, as she was first diagnosed with cancer in 1974. She reacted to this in two ways: concentrating on personal introspection and articulating worldwide messages. No longer concentrating on particular issues, Kent's work became philosophical about her own life and struggles and incorporated public messages of peace and love. 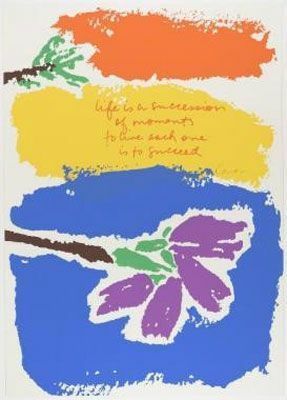 Throughout the late 1970s and early '80s, Kent's artistic output was mostly a mix of soft-hued silkscreen prints and small, pastel watercolors, or huge scale public works, designed to add positivity to daily life, but she didn't completely abandon bold, fluorescent colors. For example, she designed the now famous Love postage stamp for the US postal authority in 1985, that issued 700 million stamps with the design, and she designed the huge Rainbow Swash artwork for the Boston Gas Company's gas tanks - the largest copyrighted work of art in the world. The work caused controversy in the years following, as it was conjectured that it contained a subtle profile of Ho Chi Minh as an anti-Vietnam War protest. However, Kent denied this, saying that the design was simply a joyful rainbow, a Pop Art gift to the City of Boston. When in 1992 the Boston Gas Company tore down the original tank, there was such a backlash that they immediately reproduced the design on a new tank. In 1977, Kent was diagnosed with cancer for a second time but carried on working. However, by 1986, cancer was found to have spread to her liver. In September of 1986, she passed away at age 67. She left her copyrights and unsold artwork to the Immaculate Heart College Community, which founded the Corita Art Center. In 1980, the deCordova Museum in Massachusetts staged the first retrospective of Kent's work, called simply "Corita." However, during her lifetime, and especially in the twenty years following her death, Kent's work never quite worked its way into the mainstream. Being a female artist and a nun, she did not fit into the detached, jaded aesthetic narrative of Pop. However, since the early 2000s, Kent's work has been steadily recognized outside of the small artistic circles in L.A. and Boston. Exhibitions of her work have increased year after year in the United States and more recently also in the United Kingdom, Australia, Portugal, Switzerland, Germany, and France. During the last decade, Kent has been recognized as one of the most original and important Pop artists of her time. Donna Steele, curator of Kent's work, says it is "as important as that of Warhol....It stands up there with the work of the Pop Art greats - people like Robert Rauschenberg, Jasper Johns, Richard Hamilton, and Peter Blake. It's big and bold and it's of the moment." Not only was her work fun, modern, and culturally aware, it was simultaneously meaningful and heartfelt, with its own unique and democratic message. "What you get is this visual feast of twisted text and messages, and the more you look, the deeper you realize the messages go," says Steele. 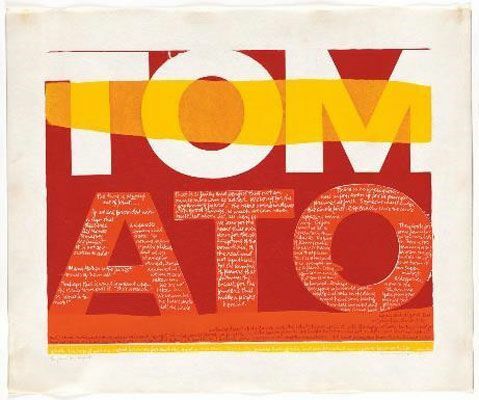 "She picked up on everyday language and advertising slogans - this was the 1960s, and consumer culture was exploding; she used words like 'tomato,' 'burger,' and 'goodness' and she made them into messages about how we live, and about humanitarianism and how we care for others." An important message is wrapped in a visual feast; as Kent explained, it was "the idea that using words with visual forms and using just short passages is often a way to help awaken people to something they may not be aware of, rather than enclosing it in a book or making a speech." Kent's art and philosophy were deeply influential in her own social circle, including the poster and graphic designer Saul Bass. However, her reach is felt just as strongly in the work of several modern printmakers, artists, and designers, including Julie Ault, Mike Kelley, and Ciara Phillips, who feel a unique emotional connection with Kent. Unlike many other Pop Artists, she had a refreshingly hopeful and compassionate approach to her work that connects with people to this day. The Lord Is With Thee was Kent's breakthrough piece after graduating from her MA program at the University of Southern California. Kent remembered of her last year at USC, "[D]uring that course I made two prints. And the summer following that, I looked at one of them, and it was really so bad that I started adding colors on top of it, making a completely new print, which is that print hanging over there called The Lord Is With Thee. It turned into a completely different picture because underneath it was a picture of the Assumption, with a very, as I remember it, a kind of fashion-modelish lady in the center. It was a very unwhole picture."